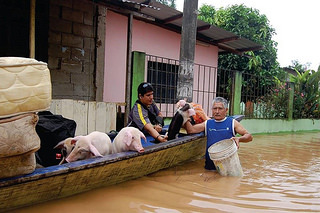 Had it not been for Caritas’ call for help, the outcome would have been different for more than 10,000 people after intense rains led to major floods in the Peruvian jungle. In the early morning hours of last January 26th, a downpour caused flooding in houses in the districts of Huepetuhe and Tambopata. During the evening of the next day, the rain caused the Tambopata and Madre de Dios rivers and their tributaries to overflow. Three days later, the Tambopata river overflowed again flooding homes and damaging a bridge which isolated 7 towns in the province. The floods damaged various crops, houses and infrastructure, and led to a state of emergency for sixty days. There were a total of nine affected districts in three provinces in the southeastern zone of the country. According to official sources, 680 houses were destroyed, 3 bridges damaged and 50 km of highways were affected. Under such a pressing situation, Caritas Peru launched the campaign “Emergencia por inundaciones en Madre de Dios” (Emergency due to floods in Madre de Dios) on February 2nd. The campaign sought help from entrepreneurs, private organisations and the general public, prioritising monetary aid over any other form of material aid as it’s helps Caritas be more flexible in responding to people’s needs. Caritas Peru has more than 48 diocesan Caritas in the country’s 24 departments. Working in conjunction with Caritas Madre de Dios, it was possible to take a census of the victims, divide up the donations, and evaluate damages. Kits containing plastic sheeting for shelters, clothes, shoes, and food such as rice, sugar, oil, lentils, tuna, and eggs, among other things, were distributed among the victims to ease their most urgent needs. Nineteen camps for people flooded out were set up in schools and community halls during the emergency. Thanks to the prompt response, it was possible to help 295 families in the area. “I lost all my manioc, plantain, rice, corn and papaya orchards. I thank Caritas for their support with shelter where I lived for more than a month, and with food, and school supplies. I was lucky enough to meet the kind people in this programme who gave us a helping hand” said Nancy León Mayorga, a beneficiary from one of the affected communities. Apart from Caritas Peru, young university students and members of religious organisations participated in the initiative.